This Rococo gown is mainly based upon dresses from the 1740s and 50s, but i like to wear it in an 1770s context, since you do not always have to adopt the latest fashion. I did not made the additional fold on the front you can normally see in the middle of the century when wearing a stomacher. The gown has an English back, En Fourreau. This means that the folds of the top of the gown run into the skirt at the back, so that you do not have a waist seam at this point. The dress is made of dark red linen I bought as two pieces, each of them smaller than 1 ½ yard (both length and wide), so that is what not easy to place the pattern on the fabric. I made the pattern myself using “The Cut and costruction of Women’s Clothes“ “Fashion in Detail 1“ and “Costume in Detail“. Originally, the design was based upon Anna strong from the TV series “Turn”, but I changed it lot. The whole dress is sewn by hand. I created an embroidery of three different woolen threads on the stomacher. 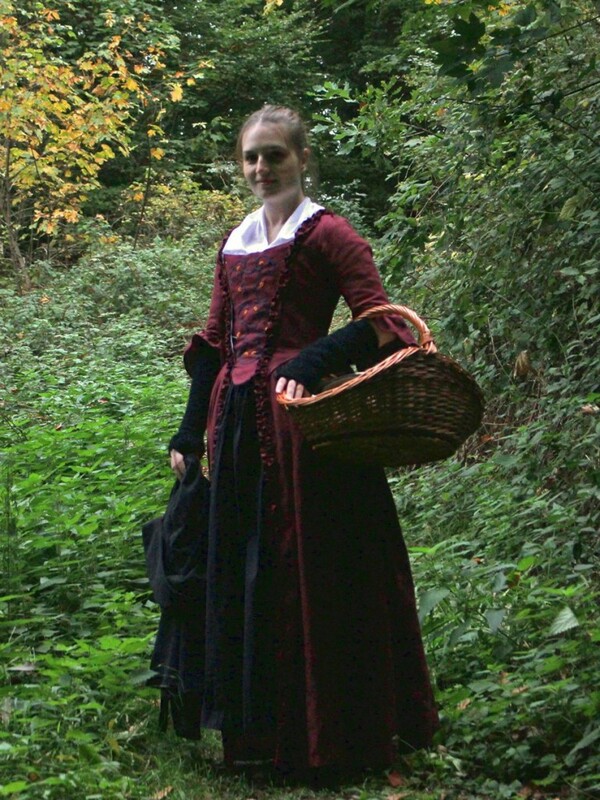 However, I wear my old black cotton skirt as a petticoat, which is machine-sewn. I have to create a new one soon. 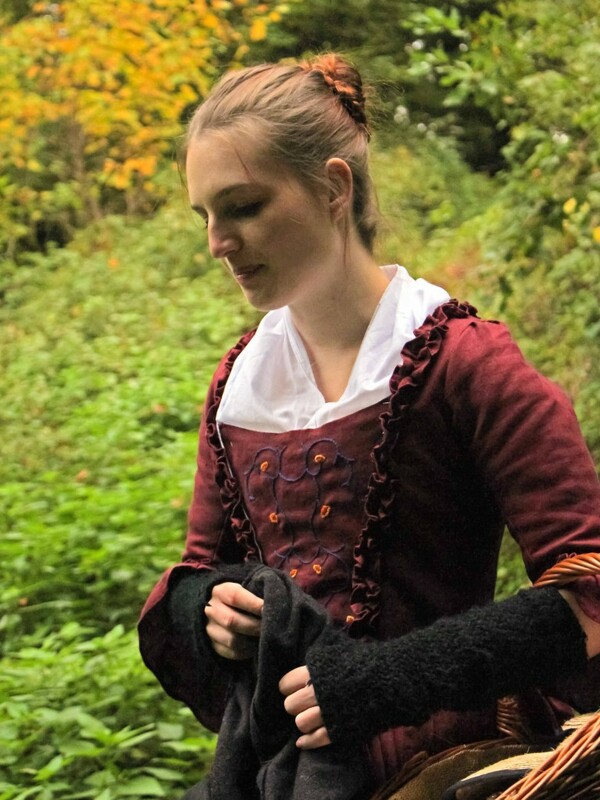 The outfit is worn with a kerchief, mitts of wool (Nadelbinding-technique) and my black hat, which was originally made for the black Round Gown and therefore is a bit late in style. thank you! Since I created the pattern for this dress myself, it only exists for my exact measurement. Therefore, it is not possible to transfer it to another person. But I have some tipps for you on making your own pattern. First of all, do you want to make a complete 18th century outfit? If you do, you can easily draw the pattern on the base of your stays pattern, because they are very flat and there are no darts any more. 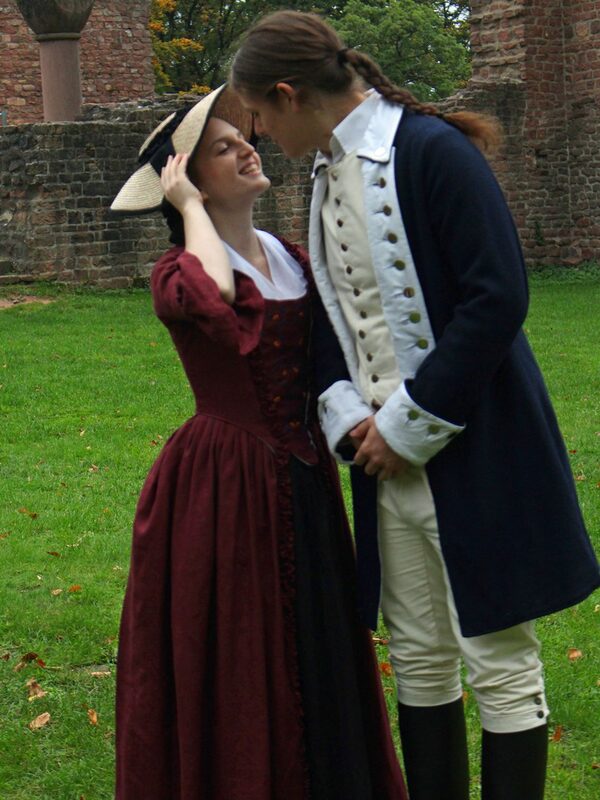 If you want to do a simple costume inspired by the look without any historical underwear, I would like to recommend the simplicity pattern 7026. Be careful with the sleeves. They are very narrow! I would be very happy to hear more about your project! If you have any problems, please write again!